Blogs about Startups are an ideal source for staying up to date on the latest developments and learn new insights about all sorts of startup topics. A good Startup Blog offers in-depth analyses, how to guides, industry trends, handy statistics insights, strategy papers, the best tools for the fixing problems and much more. The only problem is that there are a lot of Startup Blogs out there and they are all screaming for your attention. It is estimated that there are more than 440 million blogs worldwide, and about 2 million blog posts are written every day. Luckily, not all of them write about Startups, but you get the idea right? So which Startup Blogs are successful in providing the information you need and how can you find them? You can do a google search and search for the Best Startup Blogs, but then you get hundreds of “Best of Lists” in front of you, so that doesn’t help a lot either unless you want to spend a full day going through all those lists. Well, that is exactly what we did! We searched for 50 “Best of Lists” highlighting the most recommended Startup Blogs, selected and combined the 19 most valuable “Best of Lists” and earmarked and ranked what Blogs about Startups keep up appearing on most of those recently published lists. 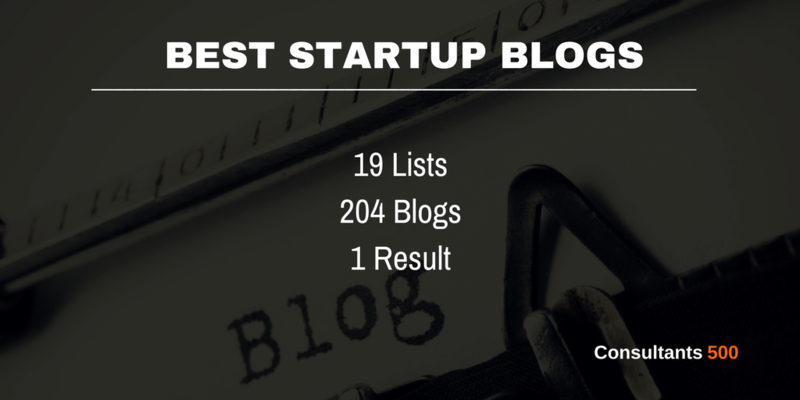 From a total of 204 Startup Blogs compared, reviewed and ranked, here are the Top 15 Startup Blogs around. As we are a small business ourselves, we use this list as well for educating and inspiring our minds and for optimizing our Consultants 500 platform, on which you can also find and search for all sorts of Startup Experts. Listed 11 out of 19 times. OnStartups is run by Dharmesh Shah who is a software entrepreneur and co-founder of HubSpot. He also graduated from MIT and wrote a thesis focused on startups so this guy knows what he is talking about. The blog is for and about software startups. Startup 101 : Should You Form An Inc. or LLC? Listed 9 out of 19 times. On this website the perspectives of Mark Suster are published, a serial entrepreneur who turned into Venture Capitalist, running Upfront Ventures, one of the largest and most active early-stage funds in Southern California. It’s no wonder why this is one of the best startup blogs to follow. Listed 9 out of 19 times. Quick Sprout is the business and marketing blog of Neil Patel, who runs this blog more as a side project. The blog is highly popular though and Neil Patel is considered to be an online marketing guru and is one of the most influential people on the web, so no wonder this side project blog ended up in the top of best startup blogs to follow. Listed 8 out of 19 times. Steve Blank is a Silicon Valley serial-entrepreneur and Stanford Academic based in California. His work defined the Mean Startup movement and he has spent over 30 years within the High Tech Industry, founding or working with over eight startup companies, four of which have gone public. Steve has written multiple books all focused on startups and entrepreneurship. Listed 4 out of 19 times. FreshBooks is one of the leading online accounting applications. Via their blog, they try to help startups and small business with actionable insights into all aspects of running a small business. Listed 5 out of 19 times. Well-known news medium focusing on breaking technology news, analysis, and opinions around technology and technology startups. Listed 4 out of 19 times. Vero enables marketing, engineering and product teams to collaborate on designing data-driven email communications. Their blog focuses on all sorts of email marketing tactics. Listed 4 out of 19 times. Horowitz is a technology entrepreneur and co-founder of one of the most successful venture capital firms in Silicon Valley. His book “The Hard Things About Hard Things” is also highly popular among startup founders and entrepreneurs. Listed 6 out of 19 times. SaaStr is a curiously popular blog turned into a global SaaS community focused on web services people pay for. Listed 4 out of 19 times. Moz is an SEO authority that provides software tools and resources to help you take full advantage of the power of SEO, whether you want to drive customers to your website or to your front door. SEO is key for most startups, so for any SEO topic, this is the first spot to take a look and see what they have to say about it. Listed 4 out of 19 times. Social Triggers teaches the perfect blend of data-driven marketing (conversion rates, academic research, and personal case studies) and content marketing to get traffic, attract customers, and sell products online. Listed 5 out of 19 times. Highly favorite conversion optimization blog and place to learn optimization, analytics, and data-driven marketing. The digital strategy of a startup may be top of the bill, however, if this strategy does not convert it is basically useless. Listed 6 out of 19 times. Kissmetrics is more than just a blog! Their online software helps marketers turn analytics into insights that guide decision-making and growth. Kissmetrics is different because it ties every visit on your website to a person – even if they’re using multiple devices. This company was co-founded by Neil Patel, the online marketing guru who is also behind our number 3 spot above, Quick Sprout, but he sold the company a while ago. Listed 4 out of 19 times. This is the personal blog of well-known Eric Ries, an entrepreneur and the author of the New York Times bestseller The Lean Startup, which has sold over one million copies and has been translated into more than thirty languages. He is the creator of the Lean Startup methodology, which has become a global movement in business, practiced by individuals and companies around the world. Listed 6 out of 19 times. This is a blog created by David Skok, a five-time entrepreneur turned Venture Capitalist. It offers in-depth, tactical advice on the key issues founders and their teams face in getting started, getting funded, and building a successful company. an entrepreneurial venture which is typically a newly emerged, fast-growing business that aims to meet a marketplace need by developing a viable business model around an innovative product, service, process or a platform. A startup is usually a company designed to effectively develop and validate a scalable business model. While Steve Blank, who runs the #4 startup blog as listed above, and who is a true Silicon Valley veteran, describes here that there are 6 types of startups, from lifestyle to small businesses, to scalable or buyable startups. He also describes that each of these 6 types of startups requires their own startup ecosystem and that governments are failing to understand this while all of them are trying to copy the success of Silicon Valley. 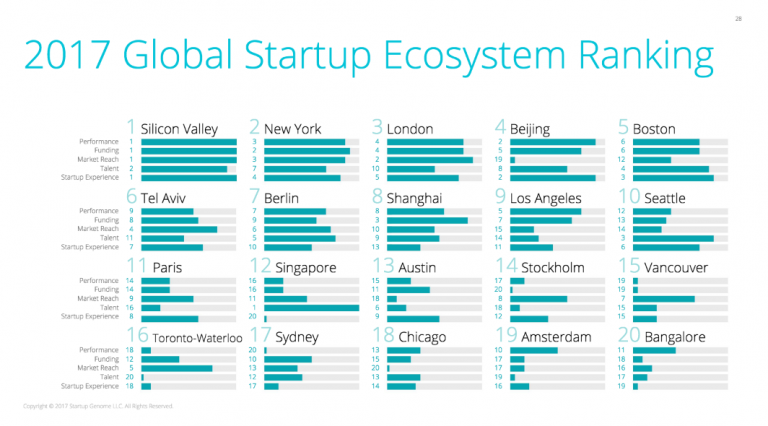 There is an obvious reason why each country or region wants to have its own Silicon Valley as they have been able to create the best startup ecosystem by far compared to the rest of the world based on the 2017 Global Startup Ecosystem Report, and which is summarized in this chart. How to accomplish this ultimate ecosystem for startups is far from easy, to say the least as it takes major investments, a lot of time, top-notch Research Institutions and Universities (with a technology focus) and last but not least a highly cooperative government who knows what it is doing. This sounds almost like an undoable blend of key criteria to accomplish such ecosystem, but still, that is how Silicon Valley evolved to what it is now as you can see below and read more about here. Startups can have a major impact on the local economy and research has found that high-growth firms account for 50% of new jobs created, create new opportunities in diverse geographic areas and encourage subsequent employment growth in their related industries. No wonder that there are so many startups on a global scale, scaling from I need to earn my money somehow to the typical tech startups. Most startups never come even close to entering the venture capital process and that can be for various reasons. Most startups fail in their early years, the ones surviving may not have the desire to go through this process as it totally changes the business undertakings and setup of the startup or if they have the desire they never meet the conditions to even start the process. 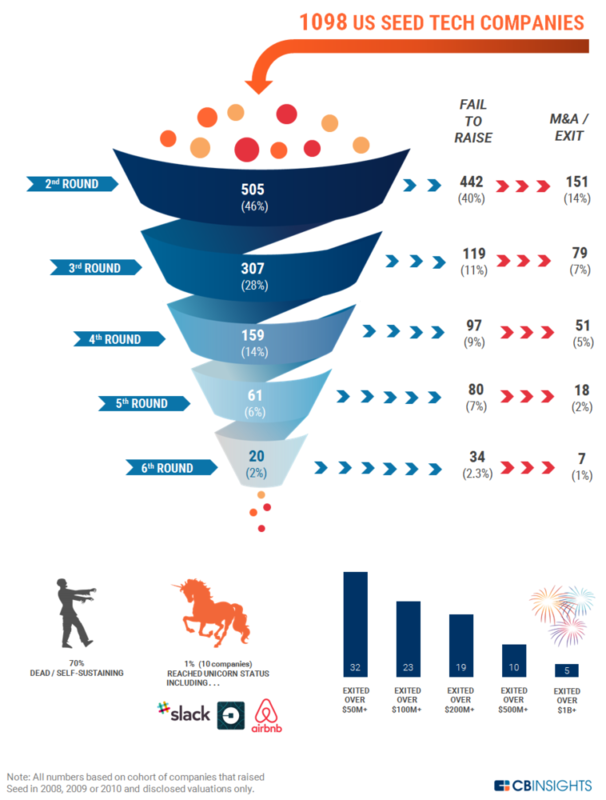 This research shows that of over a 1,000 startups entering the venture capital funnel less than 1% reached a so-called unicorn status. 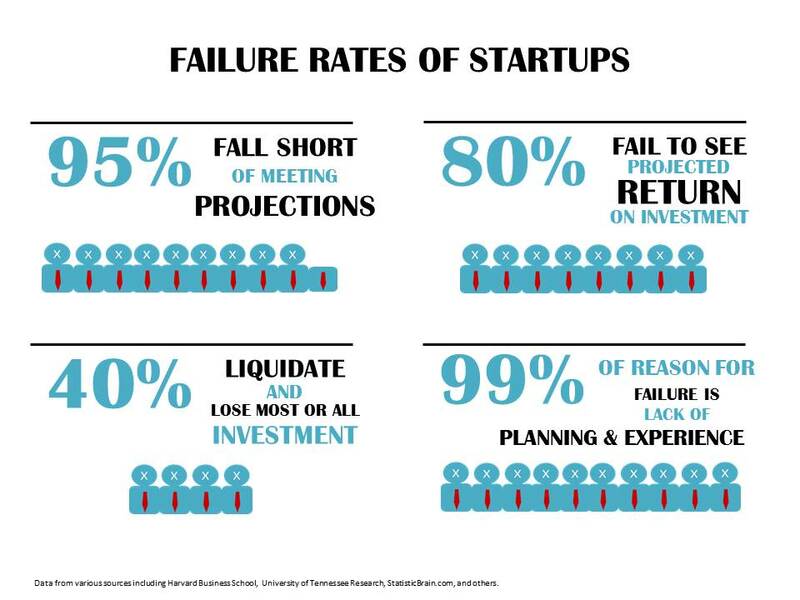 On an overall basis, and as can be seen from the below chart, the failure rate of startups is staggering. The number one reason for these failures is a lack of proper planning, but personally, I believe that this statistic includes the fact that it is just damn hard to run your own business and most people by far underestimate this (which is included in the lack of experience part). Regarded as the leading authority on content marketing and therefore on digital marketing because a digital strategy is impossible without great content. It is the leading global content marketing education and training organization, teaching enterprise brands how to attract and retain customers through compelling, multi-channel storytelling. Hubspot is known for starting the inbound marketing movement, and they are considered for giants in the marketing universe. It is a high-quality marketing blog filled with insights and tips and presents a great example of content that delivers value to its users and target customers alike. Moz is regarded as one of the leaders for SEO insights. They call themselves “the industry’s top wizards, doctors, and other experts that offer their best advice, research, how-tos, and insights—all in the name of helping you level-up your SEO and online marketing skills”. Many experts agree to this. By the way, Moz was already mentioned in the above list of Best Startup Blogs to follow so they certainly must be doing something extraordinary. The Content Marketing Institute was also listed as the number one favorite Digital Marketing Blog to follow so this clearly supports the fact that Digital Marketing and Content Marketing are highly interrelated. One of the best resources covering the latest trends and thought leadership in marketing. Individual marketers, teams, and entire marketing organizations at the world’s largest corporations rely on them to cut through the chaos to find the marketing experts you can trust and the information you need. A leading authority on content and digital marketing. In the past, it was named the #1 Content Marketing Blog in the world by Content Marketing Institute, the winner of our list. This book teaches the fundamentals of organizing a new business via a model of fast and continuous learning by testing and experimenting. Inspired by lean manufacturing, Eric Ries introduces the concept of “validated learning,” based on doing ongoing experimentations that are measured from the beginning, and adjusting or fine-tuning your direction and actions based on these findings. In this five-year study, Collins brings out the reason why some businesses have made it to the transition of good-to-great and others have not. He particularly pinpoints on the myths that businesses rely on to succeed. This book goes against the stream of what most business books say and will make you uncomfortable. It gives a procedural guide on ways to carry out modern business. The authors are software entrepreneurs who have been in the business for over a decade and have obtained sustainable profits. The book advices the reader on using prototypes instead of real designs, how flexibility is preferred in forwarding the momentum of the business, and why getting funds from outside the business can lead to the collapse of the business. It’s one of our favorite Business Books as it also stresses how important it is to prioritize and stick to that because time is scarce, especially for a startup, so you better spend your time on doing the right things and let other things go. There are a couple of reasons why there are multiple VC Blogs in the above list of Best Startup Blogs to follow and one of them is that VC’s tend to invest in the most promising startups that can scale. Lucky for us there are some VC’s who are sharing their thoughts about the challenges they typically face when investing in these startups. This is the personal and highly popular blog of Fred Wilson, a Venture Capitalist since 1986, and currently a partner at Union Squares Ventures based in New York City. He posts on a daily basis and has been doing that since September 2003. Chris Dixon is a partner at a16z, also known as Andreessen Horowitz, one of the most successful venture capital firms in Silicon Valley, and whose co-founder, Ben Horowitz, is also listed as number 8 in the above list of Best Startup Blogs to follow. Tom is a partner at the VC firm Redpoint and he writes daily data-driven blog posts about key questions facing startups. Well, if that isn’t a nice place to stroll around? Via our Consulting Community Forum, Professionals and Clients can share knowledge by having Q&A conversations about typical business issues or best practices in relation to Consulting. Here you can share your Consulting Knowledge, rank answers by how valuable they are, or just read and follow any Consulting topic you want, and get noticed when new contributions are made to discussions you follow. Want to share your favorite Consulting Resources? Just complete our online survey in less than a minute, we do not ask for your email and you can skip or answer any question you like. We will include your suggestions in one of our Best Consulting Resources Shortlists if we also like it. Then via Consulting Knowledge Resources, you can quickly find the best Consulting Resources on the web as suggested by our users and visitors via the above online survey. Think of blogs, books, learning, online courses, cheat sheets, university rankings, firm rankings, salary surveys, tools, industry reports and much more, all related to Consulting. We prepare a base list of Consulting Resources and then this list is continuously updated basis tips received from our users and visitors. More than 75% of potential Clients who look for Professional Service Providers start a Web Search to find the best Advisor for the Job. Because the internet is by far the leading channel, it is critical that your business can be easily found on the internet. Creating a profile on our Platform is free and opens the door to new opportunities, it can be done in only a few minutes and without any credit card. Easily find and compare highly qualified Startup Advisors with all sorts of backgrounds by searching our Platform, which can be Firms, Advisors or Freelance Experts. Directly contact and work with your ideal candidate in any way you like. Searching is always free, and that also means that we never charge any transaction type of fees.